This product has been discontinued. For a comparable product, click here for the Spirodoc Oxi. MIROxi surpasses the limits of all conventional instruments which can only record SPO2 and pulse rate. 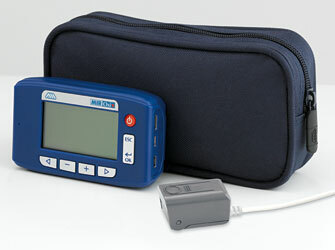 Its extensive and innovative integrated functions make it the most unique oximeter on the market. Up to 1,000 hours recording (2 or 4 second intervals). Direct printer connection via Bluetooth. Test data can be archived and then recalled using patient name. Graphic display with user-friendly icons and message to facilitate use. Online PC connection with icon interface. Internal memory with back-up of measured values, for up to 10 years even in absence of batteries. Data and graphs export also via email.